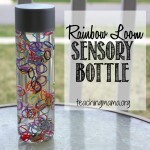 Today I’m sharing our sensory bottle for the month of May! 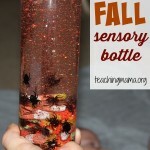 We’ve been making a new sensory bottle each month and adding it to our collection. 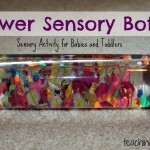 I love using sensory bottles with babies. They love to roll, shake, and look at them. 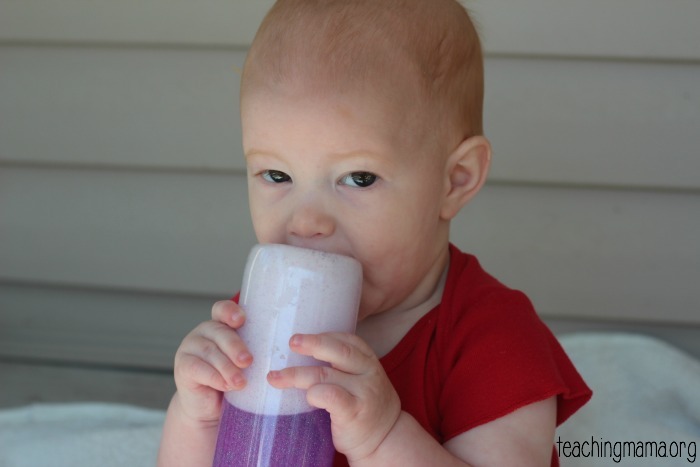 My baby is 9 months old and he is just starting to really move the sensory bottle himself. In the past, I would roll it or shake it and he would watch. It’s been fun to watch him play with it himself now! I first filled the bottle with water. 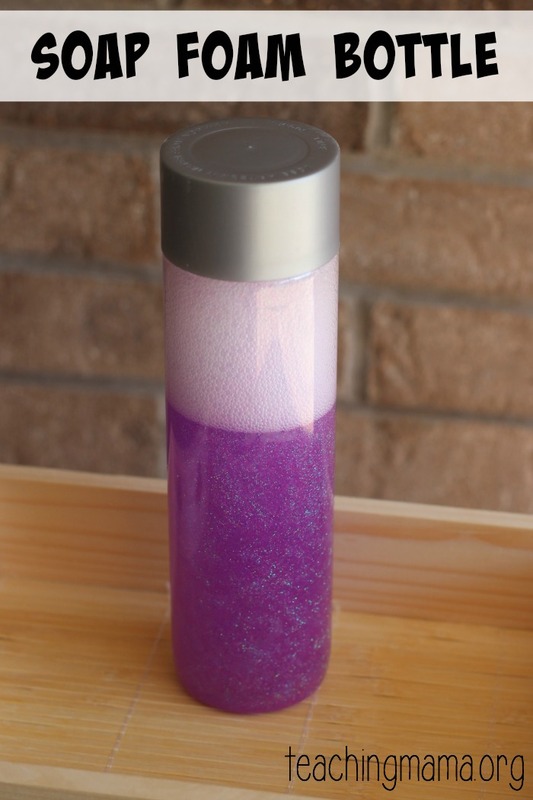 Then I added glitter, put the lid on and shook it. Then I added about 1/4 cup of dish soap. 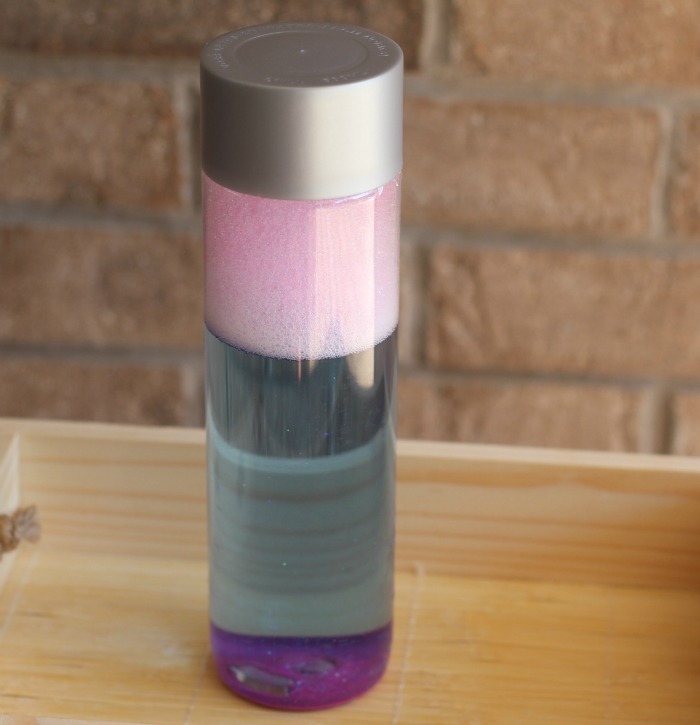 I glued the lid on with a hot glue gun. Then we shook it up. 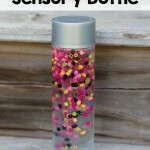 This is a fun bottle to play with. 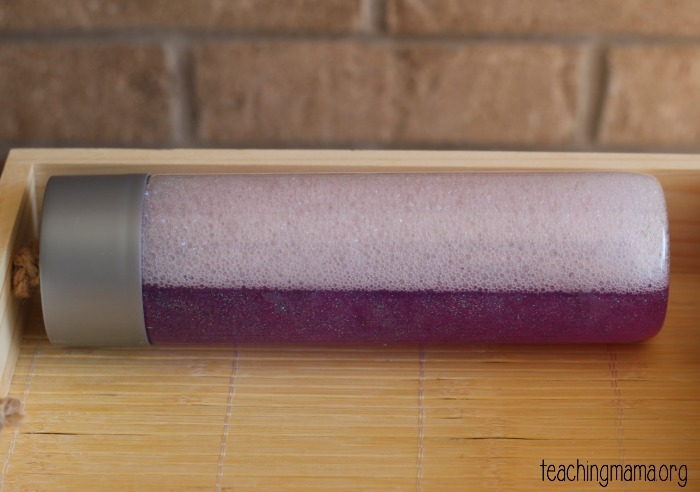 When you lay it on its side, the foam and water are divided horizontally. 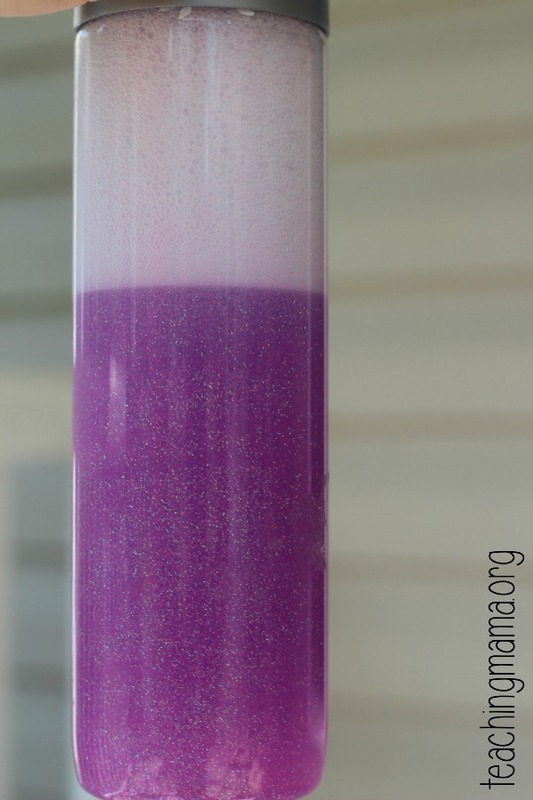 It’s fun to see the glitter swirl around when you shake it. If you let it sit, it will separate into layers. 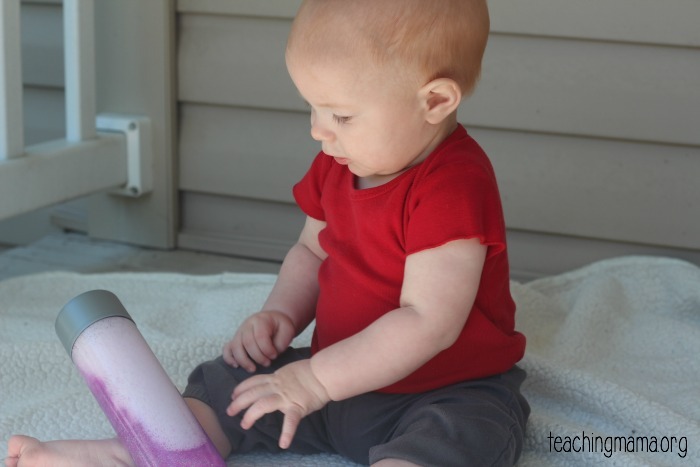 Baby Lincoln loved playing with the bottle! And of course, he need to chew on it! 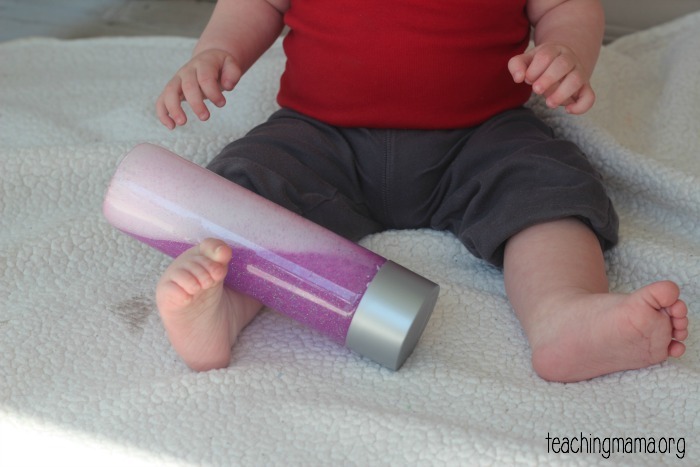 I love this idea for babies! 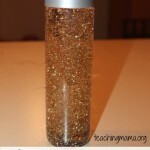 I love the way the liquid separates and they can look at the glitter! Such a great idea! Brittany recently posted…Carter’s Haul for Arden! Lovely idea! Can you tell me how you glue your bottle lids? I used the heat glue gun but it doesn’t work well. I just put a lot of hot glue on nose of the bottle and then screw on the lid. When it dries, it’s secure. It’s worked well for us. Good luck! 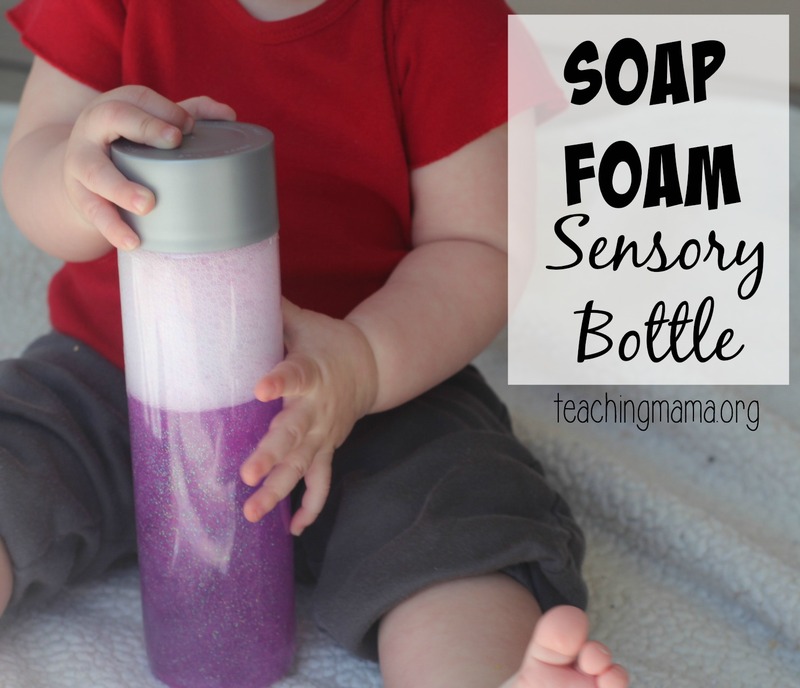 What type of soap did you use? I’m going to make these with my students as a Christmas project. Awesome! I used Dawn dish soap. I think any type of dish soap would work. Hope that helps! I didn’t. I just used colored glitter. Hi! 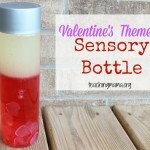 Love all your sensory bottle ideas. I plan to use these in my classroom. About how long do these last? Would I need to make them right before school started, or could I get a headstart and make them now for the school year? Thanks so much! They last SO long! Like years! We made ours a few years ago and it’s still good!